Michael Haneke has spent more than 30 years mercilessly exposing the fears and hypocrisies of the middle classes. Slow-burning ensemble drama Happy End is no exception as it focuses on a powerful, privileged bourgeois family living near Calais, and seemingly oblivious to everything that is happening right on their doorstep. Haneke is never one to spell things out and here he proceeds through the lives of the Laurent family like someone trying to tiptoe through a minefield. Every once in a while there is a small narrative explosion in which a character is revealed more sharply, or we gain a different perspective on events. Key plot developments sometimes happen off screen and there are confrontations and conversations that are seen from afar but never heard. There is a constant sense of unease at what we might learn next. We do know that 12-year-old Eve (Fantine Harduin) is capable of murder and that 85-year-old patriarch Georges (Jean-Louis Trintignant) wants to commit suicide. Once we meet the rest of the family it is easy to understand why. It says a lot about a Haneke film that Isabelle Huppert as Georges' daughter Anne seems to be the most straightforward character. This is a family mired in dirty little secrets and self-absorption, where Anne's guilt-ridden son Pierre (Franz Rogowski) may be the only one with a conscience. He creates the toe-curling moments at family gatherings, drunkenly describing servant Jamila (Nabiha Akkari) as their 'Moroccan slave'. 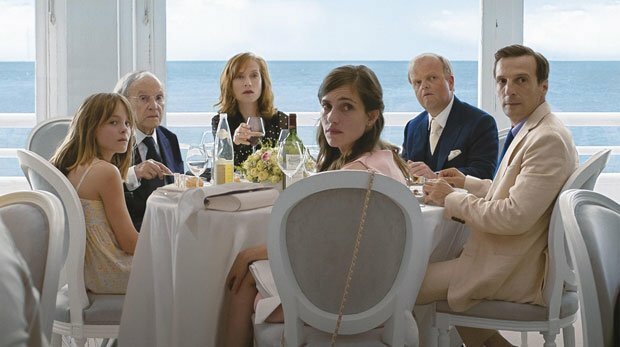 Being an ensemble piece, Happy End doesn't have quite the hypnotic intensity of previous Haneke Palme d'Or winners Amour and The White Ribbon but it is bleak and pitiless, combining black comedy and brutal satire to cut to the bone as he skewers the horrors of bourgeois complacency. The story of a powerful, privileged bourgeois family living near Calais but seemingly oblivious to everything happening on its doorstep. It’s bleak and pitiless, and doesn’t quite have the hypnotic intensity of previous Haneke films like Amour and The White Ribbon.